Methods used to deposit thin films are generally split into two categories: Physical Vapor Deposition (PVD) and Chemical Vapor Deposition (CVD), depending on the underlying principles causing film deposition. A PVD method evaporates or sputters a material, producing a gaseous plume or beam that deposits a film on the substrate. (See our Material Deposition Table for suggestions on which PVD techniques best apply to your desired film material.) A CVD method uses reactive, volatile compounds that decompose on a heated substrate. The starting materials are often organo- or hydrido-compounds that pyrolyse at relatively low temperatures into a non-volatile (film) component and a residual vapor/gas that is pumped out of the system. Both methods sub-divide into a variety of techniques with auxiliary mechanisms to achieve some goal. Please click here for further information on various deposition techniques. Electron beam evaporation sources include components that evaporate the base material through the use of a high energy electron beam, generating very high deposition rates (up to 25000 Å/min). The electron beam is focused onto the target material through the use of a magnetic field, and bombardment of the electrons generates enough heat to evaporate a wide range of materials with very high melting points. Under regular e-beam evaporation, the chamber pressure is brought to as low a level as possible to prevent background gases from chemically reacting with the film or bulk evaporant. Under carefully controlled partial pressures of reactive gases, reactive e-beam evaporation can create films of a different chemical composition than that of the bulk material. The basic configuration typically includes an electron beam source, hearth, and top cover, with accessory feedthroughs and appropriately sized power supplies. Evaporation can be done directly from the hearth or with a crucible liner depending on the intended evaporation material. Because of the ability to control deposition rate, low contamination, excellent material utilization, and very high deposition rates, electron beam evaporation is a very adaptable technique used in many thin film deposition applications. Thermal evaporation sources include components that evaporate the base material through the use of resistive element heating. Typically the bulk material is placed into a source made of refractory metal (evaporation boat, basket, or filament-heated crucible), and as power is applied, the temperature rises to facilitate evaporation. Installation costs and equipment are fairly inexpensive compared to other deposition techniques, but precise temperature control can be difficult and some evaporants' tendency to alloy with the source material makes this technique not quite as universal as others. Similar to other techniques, the chamber pressure is brought to as low a level as possible to prevent background gases from chemically reacting with the film or bulk evaporant. Under carefully controlled partial pressures of reactive gases, reactive thermal evaporation can create films of a different chemical composition than that of the bulk material. The basic configuration typically includes a boat, filament, or crucible source with accessory feedthroughs (water-cooled if necessary), cross-contamination shielding, shutters, and appropriately sized power supplies. Sputter deposition, commonly called sputtering, removes atoms/molecules from a solid target's surface, projecting them into the gas phase from which they condense on another surface. In contrast to the various evaporation techniques available, sputtering does not require melting of the base material, rarely "spits" lumps at the substrate, and the source can be mounted in any orientation. There is comparatively very little radiated heat transferred to substrates, the coverage is not strictly line-of-sight, and elemental mixtures, alloys, and compounds can be sputtered without changes in stoichiometry. A voltage is applied between the target material (cathode) and the substrate (anode) to be coated with the target material. Initial electrons from the target's surface cause cascade ionization in the chosen process gas and thus, plasma is formed. Sputtering sources are compatible with vacuum levels from a few mTorr to UHV and come in many shapes and sizes, from small 1" round type R&D cathodes to large planar production cathodes. Because the plasma is both electrically neutral and highly conductive, there is little voltage drop across it. The voltage drop occurs across thin "dark space" regions (areas between the plasma and each electrode). The target's negative potential attracts positive ions from the plasma's edge, which in turn hit the target with sufficient kinetic energies to eject neutral target atoms/molecules by energy transfer. While traveling from target to substrate, each ejected atom hits numerous gas atoms/molecules that deflect them and cause energy loss. By optimizing the target-substrate distance, the atoms approach the substrate's surface from partially randomized directions, producing a uniform film thickness across a textured substrate's surface. For circular sources, the optimum throw distance between target and substrate is larger than the target's diameter to "smooth out" the source's ring-like deposition pattern. By contrast, a linear production source used to coat large area substrates moving across it has a much shorter optimum throw distance. Similar to other techniques, the chamber pressure is brought to as low a level as possible to prevent background gases from chemically reacting with the film or sputter target. Under carefully controlled partial pressures of reactive gases, reactive sputtering can create films of a different chemical composition than that of the bulk material. The basic configuration typically includes: a TORUS® sputtering source with a target of the desired coating material; shutters; deposition chimney and/or gas injection; and appropriately sized DC, Pulsed DC, and RF power supplies. Point source evaporators, also known as LTE (Low Temperature Evaporation) Sources, are similar to filament and crucible thermal evaporators in that they evaporate the base material through the use of resistive element heating. The bulk material is placed into a crucible heated by a filament source, and as power is applied to the filament the crucible is heated. The crucible/filament structure has external shielding, a precise aperture, and thermocouple feedback to allow precise temperature control. They are compatible with UHV vacuum levels, easy to remove and replace, and allow very controllable heating in the lower temperature ranges in which organic materials evaporate. The evaporation temperatures of organic materials are low compared to that of most metals, typically much less than 500°C, and the evaporation rate is exceptionally sensitive to the material's temperature. To achieve satisfactory film deposition demands rigorous temperature control. For this purpose, low temperature evaporation sources designed specifically for depositing organic thin films are frequently used in sequential and co-deposition applications. The use of a glove box to control the ambient atmosphere for loading and unloading organic evaporants is a very useful tool for this technique. Organic compounds are typically volatile and reactive in atmospheric conditions and at room temperature. 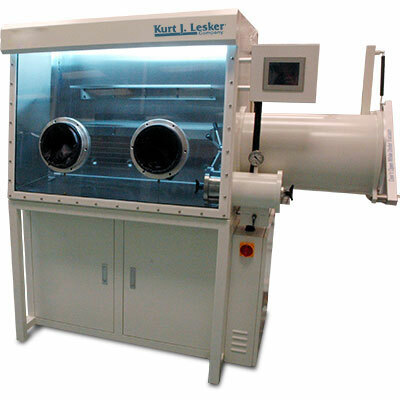 Glove box integration allows creation of an inert environment to keep and control the evaporant's native properties. The basic configuration typically includes a point source with accessory feedthroughs, cross-contamination shielding, shutters, and appropriately sized power supplies and PID controllers. See the ground breaking work being done with our tools. Learn More. Atomic Layer Deposition (ALD) is a Chemical Vapor Deposition (CVD) technique that enables surface-controlled, uniform, and conformal film growth at the atomic layer scale with excellent uniformity. Surface-controlled film growth is a unique feature of ALD that is based on sequential, self-limiting chemical reactions between gas-phase precursor molecules and active surface species. During a typical ALD process, at least two gas-phase precursors are pulsed sequentially into a reaction space where a substrate is located. A complete sequence (or cycle) is made up of a series of pulse and purge steps. Pulse steps are separated by purge steps to remove any remaining precursor and/or volatile reaction by-products from the reaction space between pulses. During each pulse step, chemical reactions between precursor molecules and active surface species yield new surface species that passivate the surface. Once the surface becomes fully passivated, reactions are complete and result in the formation of a limited number of new surface species. Uniformity depends primarily on the distribution of active surface species/sites and completion of surface reactions during each precursor pulse step. Subsequently, remaining precursor and/or reaction by-products are purged in preparation for the next pulse step. A complete cycle is required to obtain the desired material. Each cycle deposits a very specific amount of material onto the substrate surface and is repeated until the desired amount of material has been deposited, enabling very accurate control of film thickness. Thermal-based methods depend on substrate heating where the range of process temperatures resulting in ideal growth is referred to as the "ALD window." Ideal growth is characterized by chemical adsorption of surface species that is irreversible, self-limiting, and complete. Outside of the ALD temperature window growth becomes non-ideal. Plasma-Enhanced ALD (PEALD) methods utilize reactive plasma species as precursors for ALD surface reactions. Typical plasma gases include O2, N2, and H2. Benefits of PEALD include lower temperature process capability as well as new pathways for chemical reactions that would otherwise be inaccessible by purely thermal methods. Plasma treatments can also be used for substrate surface modification prior to ALD processing. The basic configuration typically includes a sealed reaction chamber with flow characteristics suitable for entry, exit of reactive precursors, multiple precursor delivery modules, and high-speed valving and software control. Typically, there is a preferred deposition technique based on the desired coating material and/or the type of film required. The material's volatility or an inappropriate system geometry may make thermal evaporation unfavorable. Perhaps the material responds well to DC sputtering but the desired compound would be better served via RF/pulse DC sputtering or reactive DC sputtering. Practical deposition systems are frequently made more versatile by installing two or more different techniques in the same chamber. In such an arrangement, a process requiring both evaporation and sputtering for co-deposition, or sequential deposition, is done without substrate re-location or breaking vacuum. Rather than different techniques, some applications need multiple examples of the same technique. This is particularly true and very common with sputtering, where an array of cathodes and/or effusion cells for organic materials may be mounted in one chamber. One critical aspect of multiple or combined techniques in one deposition system is cross-contamination. The "plume" of one material must not deposit on (contaminate) the material in another deposition source. This is achieved by careful design of sources, shields, and shutters. Another important aspect of multi-chamber systems is source orientation geometry. Evaporation sources are mounted with the vapor plume's axis vertically up. This avoids spillage if/when the material is molten at its evaporation temperature. Magnetron sputtering cathodes are not orientation dependent, i.e., they can be mounted at any angle. Two common arrangements for multiple sputter sources are "parallel" and "convergent." Parallel orientation is a common arrangement in large area coaters where a number of substrates are mounted on a rotating platen, and the platen moves to locate a substrate's center over each source's center in turn (this arrangement suits sequential layer deposition). Convergent sources have axes that meet at a point in space that coincides with the substrate surface's center-point, or offset slightly to achieve better uniformity. This arrangement is particularly useful when co-depositing different materials on a single substrate. Multi-Chamber deposition systems can also be accommodated by combining chambers/modules that house different techniques. This arrangement typically avoids cross-contamination quite well. More complex combinations interconnect UHV chambers for, perhaps, MBE deposition and surface science analysis, or high vacuum chambers for plasma etching, metal deposition, organic deposition, mask storage, ALD, etc., in a cluster arrangement. Glove box integration creates an inert environment for processing protective/sealing coatings. Reactive metal films, organic electronics, and light-emitting organic displays typically utilize coating materials that cannot be exposed to the reactive environment of the atmosphere without a protective encapsulation layer. The sealing operation is typically done under an inert gas environment rather than a vacuum chamber, thus the need for a glove box. From the glove box a sample can be loaded into or unloaded from the system or the system's load lock for vacuum deposition processing, then retrieved back into the glove box for encapsulation coating prior to venting the glove box to atmosphere. Cathodic Arc Deposition is a PVD (Physical Vapor Deposition) technique that utilizes a controlled, hard electric arc to vaporize the deposition material from a target. Because of its fairly simple deployment, high ionization rates, and usefulness for a variety of material types (including metals and ceramics) the technique has been traditionally used in hard coating and diamond like carbon applications. In contrast to typical arc sources, the filtered arc source allows separation of macroparticles from the plasma. Cathodic arc sputtering condenses ions, which offers advantages over standard magnetron sputtering for some applications due to the generation of a plasma of sputtered material rather than neutrals created in standard sputtering. This technique is useful for sputtering graphite into diamond-like carbon with a greater level of film property control than is possible with traditional cathodic arc deposition, and has also been used with silver dopant for creating antibacterial properties. Substrate biasing allows control of the arriving atoms' energy and tuning of the film's compressive stress. This technique also operates at lower pressures than traditional sputtering. Utilizing Inverted Cylindrical Magnetron technology, sputtering off-axis from a hollow cathode source can provide exceptional uniformity and offers the advantages of ion-assisted sputtering without requiring a separate ion source. Ion-assisted sputtering is commonly used in demanding applications such as high performance optical coatings. The Isoflux cylindrical magnetron combined with a patented magnetic field configuration provides uniform coatings from the end of the cathode. This configuration both sputters the desired target material and creates ions that provide the ion-assist without a secondary ion source, resulting in a simpler process and less capital equipment cost. Sputtered atoms coat a substrate placed off-axis while the magnets drive electrons and ions out of the end of the cathode through a process known as ambipolar diffusion. The result is ion-assisted sputtering without the need for a separate ion source. This technique also produces exceptional uniformity. Isoflux has demonstrated coating thickness uniformity of ±0.25% over a 16cm diameter area with no rotation or masking. Simplified substrate handling results in lower capital equipment costs and ease of use. The data shown below is for a Ta2O5 coating applied off-axis to a stationary substrate. The basic configuration typically includes: an Isoflux sputtering source with a target of the desired coating material and appropriately sized mid-frequency power supplies. High Power Impulse Magnetron Sputtering (HiPIMS) is a type of magnetron sputtering technique where high power pulses of hundreds of microseconds are applied to the magnetron target at frequencies ranging from a few Hz to several kHz. In such a discharge, the target peak power densities during the pulse can be in the order of several tens of kilowatts per square centimeter whereas the average power densities are comparable or equal to that of Direct Current, DC, Magnetron Sputtering. Of particular note is that to achieve such high power densities on a target one only needs to upgrade their power supply. The high peak power pulses on the target in HIPIMS result in plasma electron densities up to 10^19 m-3 which is three orders of magnitude higher compared to DC Sputtering. These high plasma densities promote ionization of the sputtered material forming an ionized sputtered material flux, where the ionization fraction can reach 90%. The ion flux is subject to electric and magnetic force so its direction and energy can be controlled and be used to perform substrate pre-treatment as well as to enhance film and device properties.